I’ve almost been in my own apartment for a whole week – woah! I have to say that I have no complaints so far, other than missing having my roommates around. It can be lonely! But I do love having a whole fridge to myself, being able to do dishes/use the microwave late at night, and just generally being able to do my own thing. Since I was settling into the place this week and didn’t want to cook anything complicated, I made one of my favorite pasta dishes that comes together in minutes. I make this dish often when I need to whip something up that will be quick yet satisfying. This always fits the bill! I first made this when I ventured out into the “real world,” when I was a rookie cook and new to living on my own (feels like light years ago!) 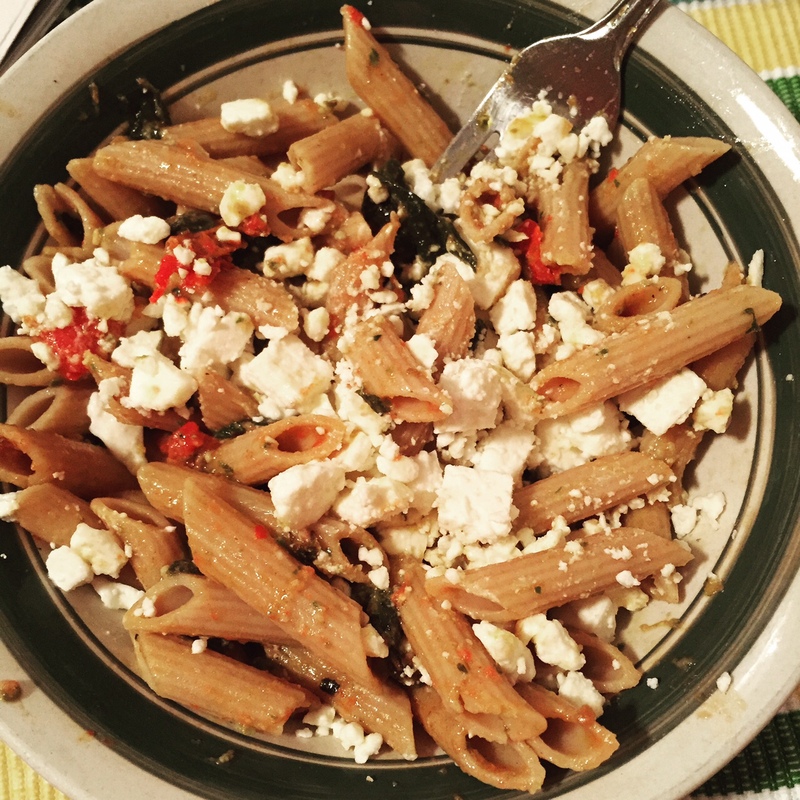 I based it on a dish my college cafeteria used to serve, which was just bow-ties with spinach, tomato, and feta cheese. So simple yet so delicious. I have tweaked it a bit to make it healthier and jazz it up, but I still owe the Stonehill College cafeteria a big thank you for introducing me to this dish! 1.) Cook pasta until desired firmness. Drain and set aside. 2.) While the pasta is cooking, heat 2 tbsp olive oil in a large sauce pan or Dutch oven on medium heat. Once oil is hot, start adding in spinach, a handful at a time, until the whole bag is wilted, stirring frequently. 3.) When spinach is wilted, add the can of diced tomatoes to the sauce pan and let simmer for a few minutes. Then add pasta and desired amount of pesto and stir everything together! 4.) Top each serving with Feta cheese and enjoy!